iWorld, Unicorn, Imagine and another offline reseller will be sold to the phone. Customers will also be able to purchase the iPhone XR from Flipkart, Jio and Airtel's online store. The iPhone XR has the latest A12 bionic chipset, 6.1-inch LCD Liquid Retina Display, and Single Rear Camera. The price of the iPhone X is lower than the iPhone X and the iPhone X Max. Talk about offers at the Indian store, here you will get a 5% cashback on the payment of City and Axis Bank Credit Card with the convenience of the non-interest EMI on the Bajaj Finserve card. With the down payment of Rs 14,999 at Airtel's online store, you can buy the phone. Pre-order booking started on Jio.com last week, if you pay with Axis or Citibank credit card, then 5 percent cashback will be available. Vodafone and Idea Cellular can also buy the iPhone XR from the site. The company Vodafone Red and Idea Nirvana have come with offers for customers. If customers with plans of Rs 499 or above buy phones from Vodafone.in or Ideacellular.com, then in the selected city, you will get 20 percent rental discount for one year with delivery in 48 hours. 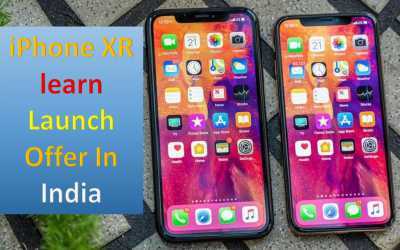 Apple iPhone XR, the price will start from Rs 76,900 in India. This price is of 64 GB variant. The price of 128 GB variants will be priced at Rs 81,900 and 256 GB variants for Rs 91,900. On October 26, i.e. from 6 a.m. today, the phone sale will begin on the offline and online partner of Apple. Customers can buy the phone in Black, Blue, Coral, Red, White, and Yellow. Dual sim dual standby smartphone will run on iPhone X R Out of Box iOS 12. It has a 6.1-inch (828x1792-pixel) LCD retina display. The top of the display is in Nokia, in which the TruePath camera system has got a place. There is no 3D touch support in it. The new model is equipped with a haptic touch. iPhone X R uses Apple's own A12 bionic processor in 2018. About 30 percent faster app launch time has been claimed. The iPhone XR has three options for inbuilt storage - 64 GB, 128 GB, and 256 GB. This phone is a 7000-series aerospace-grade aluminum build. This phone got the IP 67 rating. To capture photos and videos, the camera has a 12 megapixel rear facing. Its aperture is F / 1.8. The rear sensor comes with quad-led True Tone with flash and optical image stabilization. The front panel camera has a 7-megapixel camera with F / 2.2 aperture. This camera phone will allow users to take better pictures in portrait mode.